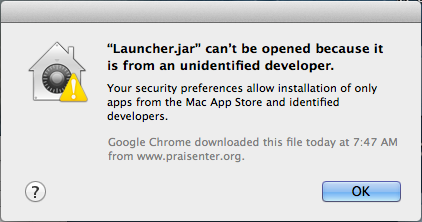 Praisenter works on Mac OS X, with some preparation from the user (you). You must have Mac OS X 10.7.3 64bit or higher. You can check this by going to the “Apple” in the top left corner of the screen and choosing “About This Mac.” Here you will see the version of OS X you have. Typically, if your Mac was built in 2008 or later it is 64bit. Check out this article to be sure. After you have verified you are running a supported version of Mac OS X, the next step is to verify the version of Java you have installed. Go to the “Apple” in the top left corner, then “System Preferences…”, then “Java.” On the “Update” tab you should see the Java version (Java 7 Update 21 for example). Java 7 is the same as Java 1.7. If you do not have Java 1.7 installed, go to http://www.java.com and click download and follow the instructions to install the latest Java. If you need more instructions take a look at this article. As of OS X 10.7, Apple no longer develops it’s own Java runtime. Because of this, if you purchased a Mac with OS X 10.7 or later installed, it likely doesn’t have Java installed at all. If you had OS X 10.6 or earlier and have upgraded to 10.7, you probably have Apple’s version of Java 1.6. In either case, you will need to download and install the latest Java from another vendor (typically Oracle). However, before doing this, please read through this article to answer any questions you may have. The Webstart download has the benefit of automatic updates (when an internet connection is available) and creation of a desktop shortcut/icon. It will also verify that you are running Java 1.7 or higher. If you aren’t it will prompt you to download the latest version. Check the “I accept the risk and want to run this application.” checkbox and click the “Run” button. You can check the box “Always trust this publisher”, under the “Show Options” dropdown, so that you won’t be prompted for this again. If a desktop shortcut is not created you can create it manually by going to the “Apple” in the top left corner of the screen, then choose “System Preferences…”, then “Java”. On the “General” tab click the “View…” button. Select the “Praisenter” entry and click the to create the short cut. Then close these windows. Whenever downloading a new version of Praisenter using Webstart you should clear the Webstart cache. The desktop shortcut may not be created if this is not done. To clear the Webstart cache go to the “Apple” in the top left corner of the screen, then choose “System Preferences…”, then “Java”. On the “General” tab click the “View…” button. Select all “Praisenter” entries and click the to delete the cache, then close these windows. The Archive download does not require internet access to run. However, the archive does not perform automatic updates or check the version of Java you are running. This download should be used by advanced users or those without internet access. Double click the Praisenter.zip file to decompress the archive file. If you used Safari to download, this will already be done for you. 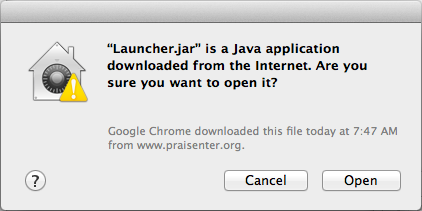 Double click the Launcher.jar file to run. Click “Open” to run. After this, be sure to change the “Allow applications downloaded from:” setting back to the previous setting. The Safari web browser (which is the default browser on Mac OS X) will automatically decompress any archive files (.zip for example) downloaded. This can be a nice feature unless you need the file to remain as is. Praisenter expects bibles and exported slides/templates to be .zip files. Disable this feature in Safari. Open Safari and go to “Safari”, then “Preferences…”, then “General”, then uncheck the option that says “Open “safe” files after downloading”. Use a different browser to download files (Firefox, Google Chrome, etc). Or re-compress the files manually. States file cannot be opened as it is from an unknown developer. This is due to Praisenter being self-signed; the keyword here being “self.” As a result, the identity cannot be verified against a trusted certificate authority to ensure that it was made by who it says. There was also a Java update (1.7.0_51) recently (January 14 2014 I believe) that made it to where all self signed Java applications are blocked (sigh). Turning your security down to Medium (not recommended). 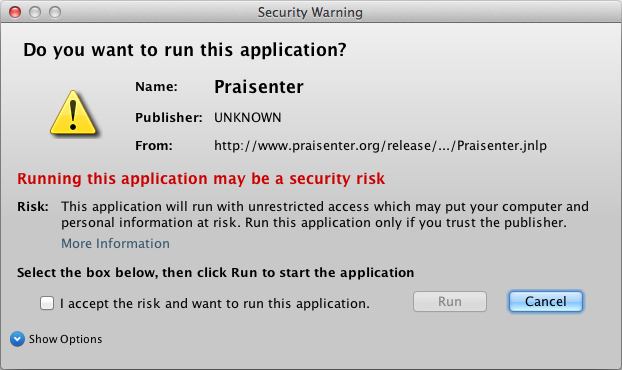 Adding http://www.praisenter.org to the Exception Site List (recommended). I plan to add instructions on how to do this to the downloads page to help everyone, I’ve just been strapped for time. If you need more help just let me know.